Click here for links to all lessons on The Baptists in Rhode Island. A book of lies, deceit, and historic revisionism. The Calvinist revisionist account of Williams does not chronicle the facts. Instead, it is a distortion of facts. Williams did not super-spiritualize Christianity. He pointed out that the Bible teaches that a church and a Gentile nation are to operate under different rules than did Judaism and the nation Israel. He did not remove Christianity from all contact with the sinful realities of daily living. He correctly argued that the church deals with those realities in a manner differing from that of Judaism and the nation Israel in the theocracy. He believed that man should have freedom of conscience in all things spiritual, a concept diametrically opposed to the theology of the established church of Massachusetts. He believed that penal laws should deal only with man’s relationship with his fellow man. He believed, contrary to Puritan theology, that the church should not merge with the state for any reason, and that the state should enforce only those commandments dealing with man’s relationship with man (the last six of the Commandments), not the first four of the Commandments which deal with man’s relationship to God. He condemned the king’s patent and taught that it was wrong to take the land of the natives without payment. Williams did not believe that liberty of conscience becomes a license to disregard all authority with which we do not happen to agree. He correctly believed that the laws of a civil government should protect freedom of conscience, and that God limited the jurisdiction of every Gentile civil government to certain actions by citizens against other citizens—to the Second Table of the Ten Commandments. “I acknowledge [the civil magistrate] ought to cherish, as a foster-father, the Lord Jesus, in his truth, in his saints, to cleave unto them himself, and to countenance them even to the death, yea, also, to break the teeth of the lions, who offer civil violence and injury to them. “Since God’s will was made known to them [the Puritans] through His inspired word in the Bible, they naturally wanted to get as close to a Scriptural order of worship as possible. Indeed, what they ultimately wanted was to bring the Church back to something approximating New Testament Christianity. “The Puritan dilemma was similar to that of many newly regenerate Christians of our time. They faced a difficult choice: should they leave their seemingly lifeless churches to join or start a live one, or should they stay where they were, to be used as that one small candle to which William Bradford referred? “God was bringing the Puritans into compassion and humility. The Puritans grew into such compassion and humility that they horribly persecuted Christians and others who did not agree with the unbiblical doctrines which they proudly believed to be inerrant. Williams, in his relationship to the religious leaders of Massachusetts, was a lot like the Lord Jesus and the apostles in their relationship to the religious Jews. The religious leaders of Massachusetts made a mistake—they did not call upon the civil government (which was at their disposal) to kill Williams as they did with some other dissenters. Had they done so, we might not have our present form of civil government. They only banished him, to them a tragic error of highest proportions as it turned out. Under the theology of Marshall and Manuel, and those of like mind, the government of Rhode Island—which provided a model for the First Amendment—would not have existed nor would the United States exist in its present form. America would have no First Amendment to the United States Constitution, the amendment written and adopted to provide for freedom of religion and conscience. Men would still be forced to accept infant baptism, pay taxes to support the established church, attend the established church, proclaim allegiance to the established church, etc. Dissenters would still be persecuted. The church would still be working with the state to build a “city set upon a hill.” Fittingly, the Puritan experiment was already falling apart by 1660 as is shown in The Results of Puritan Theology in Massachusetts Soon Came to Fruition. The Puritans, like all prior and future combinations of church and state brought corruption to Massachusetts, to the church, and to the people. True to form, Calvinism, being spiritually dead, killed the Puritan churches. Peter Marshall and David Manuel, The Light and the Glory, (Old Tappan, New Jersey: Fleming H. Revell Company, 1977), p. 146. Roger Williams and Edward Bean Underhill, The Bloudy Tenent of Persecution for Cause of Conscience Discussed and Mr. Cotton’s Letter Examined and Answered (London: Printed for the Society, by J. Haddon, Castle Street, Finsbury, 1848), pp. 100-101. In this book, The Bloudy Tenent of Persecution for Cause of Conscience Discussed and Mr. Cotton’s Letter Examined and Answered, Williams addresses the arguments presented by Covenant Theologians. Marshall and Manuel, The Light and the Glory, p.194. Ibid., pp. 150, 151, 152, 159. John T. Christian, A History of the Baptists, Volume II, (Texarkana, Ark.-Tex. : Bogard Press, 1922), p. 33. Ibid., p. 33, citing Adams, Massachusetts: Its Historians and Its History, 34, 1893. 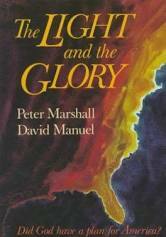 Marshall and Manuel, The Light and the Glory, pp. 108-109.